TWINS! BOYS! Handmade, four tiers Diaper Cake will be the best gift at the baby shower! 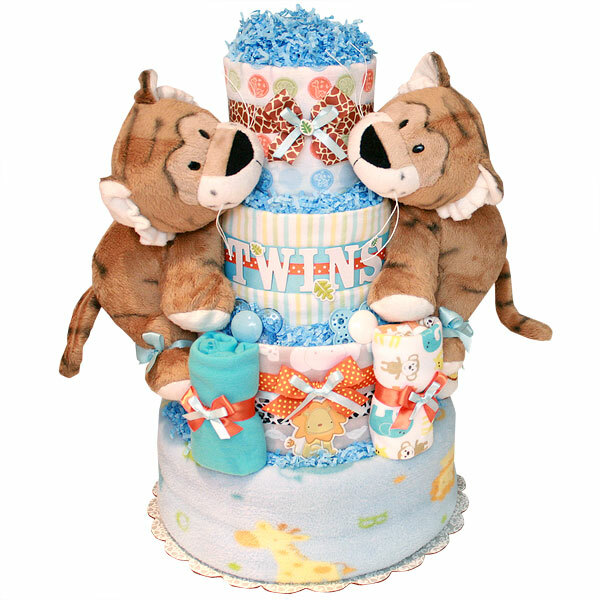 Tiger Twins Diaper Cake is a great baby shower gift and a gorgeous centerpiece for a Jungle themed baby shower. Can also be used to welcome new BABIES in the hospital room. This cake is made of 70-80 Huggies Snug&Dry diapers size 1-2 (7-15 lbs. ), Three flannel receiving blankets 100% cotton, Two bodysuits, One soft blanket, Two tigers plush toys, two pacifiers, two bibs; two Baby bottles; two pairs of baby socks; two pairs of baby mittens; scrapbook embellishments.